What is it? A large sausage filled with small chunks of cheese (German: Käse) to which the Käsekrainer owes its name. Fried or grilled, which melts the cheese, then served hot. Eaten with: A white bread roll or crust/slice of dark bread, plus mustard and/or ketchup. Also eaten as a kind of hot dog, inserted into a small baguette-like roll – particularly in soccer stadiums. Notable facts: There’s something strangely mesmerising about slicing into a Käsekrainer and seeing hot, melted cheese ooze or squirt out. In fact, if you’re not careful, a sufficiently-distressed Käsekrainer can propel hot fat huge distances, necessitating the wearing of protective goggles and clothes normally seen in radiation labs. Also called: An “Eitrige”, from the German word “eitrig” which means ulcerous or pus-filled. A rather unpleasant description, but understandable when you see cheese seeping out of a sliced Käsekrainer. There is some debate as to whether this term is a real Viennese one, or was invented to impress/scare tourists. Good to know: The Käsekrainer almost caused a diplomatic incident between Slovenia and Austria. 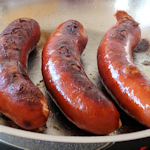 The Slovenians persuaded the EU to give the Kranjska klobasa (German: Krainer Wurst, English: Carniolan sausage) the status of a “protected geographical indication”, reflecting its origins in the Krain region – an area that is now modern Slovenia and which includes the capital, Ljubljana. This would normally make it illegal to sell any Krainer Wurst under that name, unless sourced from the area in question. Which would have spelled (literally) the end of the Käsekrainer, which is simply a variant of the Krainer Wurst. Naturally this didn’t sit well with the Viennese authorities, concerned about the loss of such a culturally-significant icon (and the renaming costs). Fortunately the Slovenians were kind enough to accept a compromise and the Käsekrainer can still be called as such. There’s a special place in my heart (presumably now blocked by cholesterol) for this sausage, as it was the first I ate in Vienna. Unfortunately, I misread the signs and called it a Kaiserkrainer, which sounded entirely plausible given Vienna’s Imperial history. For the next fifteen years I kept ordering a Kaiserkrainer, to be met with the inquiry, “You mean Käsekrainer?” Which I always assumed was just local dialect for Kaiserkrainer and they were merely checking whether they’d heard me properly. Fifteen. Years.